At first glance, you might think it’s a bit weird to put the price of the whisky right on the front label. Then you might think that this is pretty expensive for an NAS whisky. Well fear not, that’s not the price of the bottle on the label. That’s the price of the distillery. Perhaps some explanation is in order. Glanfarclas distillery was licensed in 1836 by Robert Hay. For reasons unknown (but speculated to be due to health issues) Robert sold the distillery to John Grant in 1865 for £511.19s.0d. 1865 happens to be 150 years ago. So this expression was released to commemorate the 150th year of Grant ownership of the Glenfarclas distillery. Hence the name. 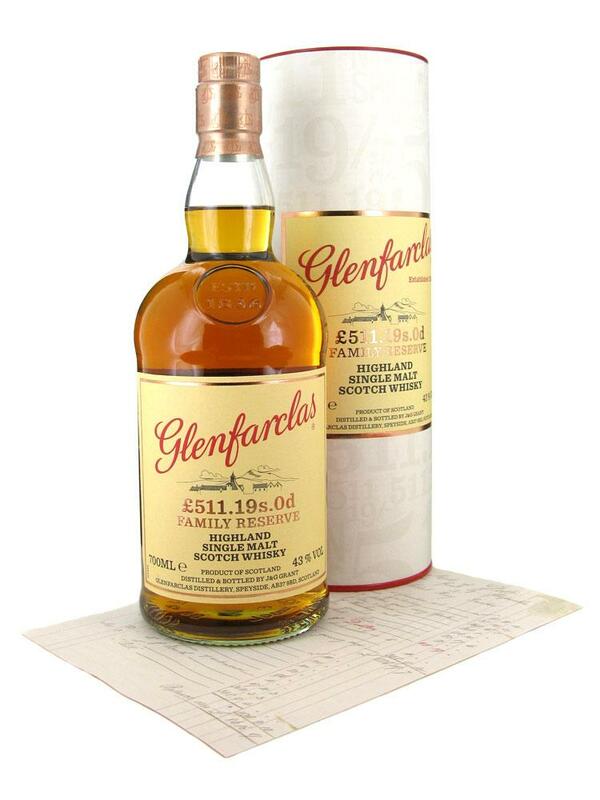 As you may know Glenfarclas is one of the last remaining family owned distilleries. The Grant’s are still in posession of this fine establishment and they seemed to have a liking for the names John and George. The succession of owners goes something like this: John, George/John, George, George, and John. Nutty marzipan and roasted almonds. Burning beeswax candles. Some sweet scents of dried fruits. Starts sweet like dried cranberries and trailmix. Then becomes nutty and slightly bitter. Almond skins and vanilla bark. Sweet spicy kiss good night. A nice dram. Resembles the 15 to me when we tasted it alongside the 15 at the distillery. Metal and chlorine dominate. Most similar to the Glenfarclas 15 with the strange chlorine tanginess. Pickled apples. Slight bit of cinnamon in the background. Chicken Maruchan instant ramen noodles seriously. There are some more complex aromas in there like stewed fruits with spices but it’s kind of hidden under the metal, chlorine, and instant ramen. Spicy apples in syrup with tannin and pennies in a heavily chlorinated fountain at Disneyland. Tangy bitter and a bit spicy oak. Bitterness like apples hangs in there for a while. Hmmm for me this was an odd one. I typically like funky whiskies but this just seemed weird in the wrong way. I have a feeling a lot of people will praise it and fair enough it’s quite personal but I just can’t seem to enjoy it. We tried this at the distillery and during our tasting session the tour guide said that within Glenfarclas there are basically two camps. One prefers the 15 year old and the other prefers the 21. I think he said that the owner, John L.S. Grant, preferred the 21. I am in the 21 camp. I think if you are in the 15 camp then you might like this dram. You might like it a lot. Maybe.